We Had Two Fake Government Shutdown Threats in 2017. This Time, It’s Real. Analysts who warn about government shutdowns are often viewed as the boy who cried wolf. 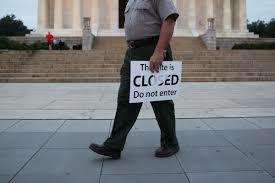 We’ve had a few government shutdowns in recent years, most recently in 2013, and two in the 1990s. These were considered true government shutdowns in the sense that Congress did not authorize spending for any agency, and all “non-essential” government employees were put on furlough. (Critical functions such as military, TSA, postal service and air traffic control continue regardless of any shutdown). We had a debt ceiling shutdown in 2011. Those are far more dangerous to markets because they call into question the Treasury’s ability to pay the national debt. We’ve had two near shutdowns this year; one in March, and again at the end of September. Both times Congress passed a last minute “continuing resolution” or CR that keeps government funding at current levels and keeps the doors open until a final budget can be worked out. The current CR expires on December 8. This time the odds are high that the government actually will shut down. Why should investors be any more concerned about this shutdown than the one in 2013 or the near misses earlier this year? There are several causes for concern. The first is that there is less room for compromise. The White House wants funding for the Wall with Mexico. Many Republican members of Congress want to defund Planned Parenthood. The Democrats will not vote for the Wall or to defund Planned Parenthood, but do want more funding for Obamacare. There is no middle ground on any of these issues so the chance of a long shutdown is quite high. The second reason is that this shutdown comes at a time when the U.S. in facing an increased risk of war with North Korea, and Congress has many other tasks on its plate including tax reform, confirmation of a new Fed Chairman, the “Dreamers” legislation, and more. Political dysfunction in Washington can easily spill over into markets. As this article shows, this time the wolf may be real.